Tax Day may be behind us, but we’re not done talking taxes yet. Because the White House and Congress have promised a simpler, fairer tax system, we expect the tax reform debate to take center stage in the months ahead. Tax reform jargon can be confusing, so we’ve created a handy “cheat sheet” on the terms and policies most likely to impact your business. MSCI will soon be circulating a survey gathering data on members’ positions on tax reform, so we can best represent the needs of member companies. In the meantime, we welcome you to download our cheat sheet on federal tax reform terminology so you can stay abreast of the debate as it unfolds in the media in the coming months. 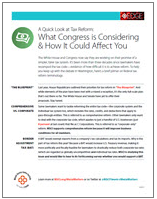 Download the cheat sheet “A Quick Look at Federal Tax Reform” here. Learn more about MSCI’s position on tax reform on our advocacy issue page. Did You Know The United States’ Outdated Infrastructure Costs Families $9 A Day? What’s The Future Of The New NAFTA?